"Once you find out your mother is an alien, what ISN’T possible? That’s what 12-year-old Anne and 10-year-old Atticus Reade want to know. Minutes after learning that their mother is from the planet Farbookonia and that their parents’ secret project has put them all in danger, the children are wrenched from their sheltered existence in the Midwest and whisked off to sleep-away camp in New Jersey — each with a tiny, protective “Globot” on one shoulder. Just as they start getting the hang of life among young Earth humans, a broadcast on the Rec Hall TV shakes things up, and things that are truly strange emerge from normal newness. It turns out Anne and Atticus — and their new friends — may not be safe at camp after all. 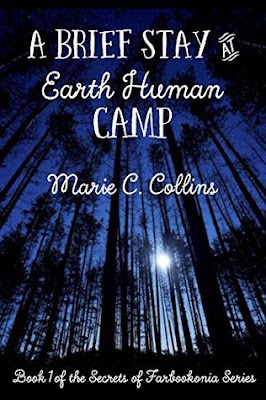 A Brief Stay at Earth Human Camp thrusts them into a reality they wish was fiction." ‘A Brief Stay at Earth Human Camp’ by Marie C. Collins is a middle-grade sci-fi adventure about a pair of half-human, half-alien siblings trying to fit in at an American summer camp. Marie kindly sent me an e-copy to read and review. Anne and Atticus Reade believe they are perfectly normal human children until they are suddenly told by their parents that their mother, Cameo, is actually an extra-terrestrial being from the planet Farbookonia. True, their upbringing has been very unconventional; living way out in the countryside, home-schooled, and never having had contact with anyone other than each other, their parents and Friday, their housekeeper, but they had no reason to believe that wasn’t normal. Plus they have special gifts, Anne can performs tasks with super speed and Atticus can communicate with animals. But these children’s lives are turned upside-down when their parents confess the truth, and proclaim that their scientific research is under threat, meaning that they will have to jet off to a secret lab, leaving Anne and Atticus at a summer camp for three weeks. The children are thrust out of their secluded lives and will have to fit in with other kids their age, which means learning how to behave and not using their special gifts. To help them out, their father has made them a small holographic being each (Globots) that only they can see and hear. Bella (for Anne) and Huck (for Atticus) sit on their shoulders and give advice about how to behave and what to say. Anne and Atticus’s first impressions of Earth humans are not great. Upon arriving at camp they are split up. Anne, at 12 years old is put in the Bobcats cabin, and Atticus, at 10 is put in the Timber Rattlesnakes cabin. And the kids assigned to take them to their bunks, Arianna and Max, are not very friendly. They soon make friends, however, with their bunk mates Maylin and Nicola, and before long are welcomed into the group. They find Bella and Huck’s information very handy, but a few days in both the Globots have malfunctioned, leaving Anne and Atticus entirely on their own. But their instincts click in, and with the help of their new friends they both have a fantastic time. But there’s trouble in paradise. A few days in the Camp Director, Aunt Maddie, mysteriously vanishes leaving a new director in her place. The new Madam Director acts very strangely, not joining in with activities and yelling ‘YOU SHOULD NOT BE HERE’ at anyone who goes near the old ruins near camp. Another camper, Benedek, is also acting weird and clinging on to the bully, Max. Things go from bad to worse when Max is poisoned and the nurse ends up in a weird coma state that she won’t wake from. Anne and Atticus believe their parents may be involved, and this is to do with their research… involving robots! Now the kids have to save Aunt Maddie and everyone else in camp before Parents Day! This was such a fantastic, FANTASTIC book! I enjoyed every sentence from start to finish, and even though it’s pretty long for a middle-grade book I was so disappointed when it ended. I loved the writing style. It was very conversational and easy to read that I found it almost impossible to look away from my screen and read the whole book in only a few sittings. Anne and Atticus are both brilliant characters and I loved seeing the world from their point of view. We don’t have camps like this in the UK so I was just as in the dark about what goes on as these children were. I think the maps and camp schedule at the beginning of the book were a really nice touch, and it was great to go back to them throughout to get a really good idea of where everything was. I love how this book mixed the adventure and sci-fi. The alien aspect was great, but the real sci-fi element came from the robots. I really didn’t see it coming! This truly was a brilliant read and I’d recommend it to kids aged 10+ and adults who love a great story with fantastic characters. I’m looking forward to reading more of Marie’s work in the future. The way this book ended makes me think there’s opportunity for a sequel, so I really hope that happens as I would love to read more about these characters and the Farbookonians!